We love music, we like MP3, so we can play music anywhere, anytime. We can download MP3 music from internet, put them into MP3 player, and carry them very easy. But most music sites do not offer download music, especial some main music sites. We can use some special downloaders to catch tracks if they can play online. 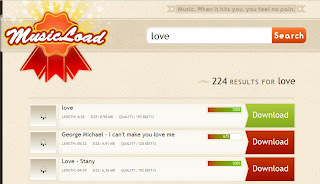 Only few sites offer download music for free, Musicload is one. Musicload combines search function, just fill song name, album, and artist, click "Get it" button, it will give a list that search results you can download. It is really simple but works fine. I do not know how long Musicload can keep, it says that is legal, because resource from music videos, they extract audio and convert to MP3 file.